Saint Louis, MO, March 5, 2010 – Gateway Pet Guardians’ second annual Pasta for Pets event will raise money toward the construction of a much-needed animal shelter in the St. Louis area. 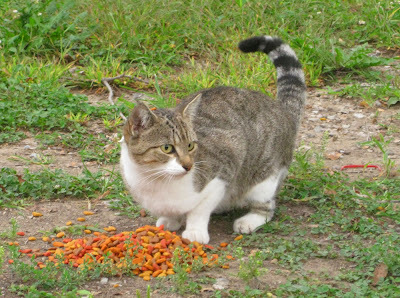 Eat at The Pasta House Co. in Fairview Heights any time Thursday, April 15, and a portion of the cost of your meal will go to Gateway Pet Guardians to benefit homeless animals. Thanks to everyone who has donated, volunteered, fostered, or otherwise helped out in the last two weeks. Thanks to dedicated people like you, Gateway Pet Guardians was able to rescue 25 dogs from the cold streets of East St. Louis in just 14 days. We were able to rescue Chenille on Tuesday. Turns out she is not pregnant. Doesn’t she look pregnant? She is being treated for heartworm and is safe at the vet, but still needs a foster home. Which brings me to why I am sending this newsletter. It is COLD outside and it is only getting colder. We will pull as many dogs as we have fosters for. 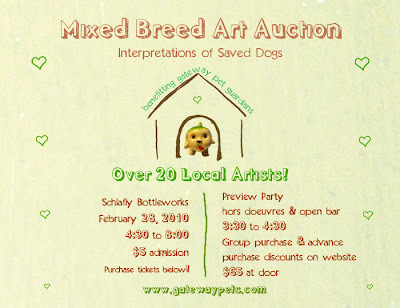 Saint Louis, MO, December 5, 2009 – Schlafly Bottleworks in Maplewood is the destination for lovers of animals and art alike on Sunday, February 28th for Gateway Pet Guardians’ Mixed Breed Art Auction.